There are very few speaker repair people left in the industy. 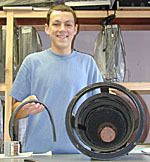 We send drivers which need repair out to a speaker specialist for repair. Shipping costs will be added to the cost of the repair. Some tweeters and small midranges cannot be repaired, they must be replaced-please contact us. Unlike many refoam-only services, he will repair whatever may be wrong with the driver. With older drivers we typically see problems in addition to rotted foam, including problems with the voice coil and speaker suspension. All problems are addressed in the reconditioning process. Also, there are many different types of foam. Not all foam surrounds will work well on every woofer. He has many different foam products available to match the original type used. Also, he can often custom-cut foam for odd sized and shaped woofers. He can usually repair the B&W 801 woofers, which are no longer supported by B&W, as well as most other high-end speakers and subwoofers. We also repair the KEF 103 and 104 series speakers with the internal woofers.
" On another note...I cannot thank you enough for the fabulous job you did in repairing the speakers...they sound 100 times better now than when I bought them 7 years ago...I knew they were good speakers but NOT THAT GOOD!" When shipping pairs of drivers, always tape units face to face. Do not place any soft materials, such as bubble pack or foam in between. When shipping individual drivers, tape a piece of stiff cardboard in front, to protect cone and spider. Never use bubble-pack or foam in direct contact with cone. Do not pack in peanuts, use bubble pack or foam rubber. Use a large enough box to allow for sufficient packing material. "Wanted to let you know how pleased I am with my speakers. They look great, but even more important, they sound great. I love them. Thank you." Send in your unit today for evaluation and repair. Copyright © 1999 - 2018 Approved Audio Service, Inc.